This week, I'm giving away a copy of Dana Haynes' Ice Cold Kill, so I thought it was a perfect time to introduce him to readers. Maybe you'll be even more interested in reading the book after you hear from Dana. Lesa - Dana, thank you for taking time to answer some questions for the readers at Lesa's Book Critiques. Would you introduce yourself to my readers? 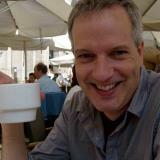 Dana - I'm a journalist who cut his teeth in small, weekly newspapers in and around Portland, Oregon. I spent 20 years as a reporter, columnist and editor, both at weeklies and dailies. And during that time, I worked on my second career as a novelist. I had three mystery novels published by Bantam Books under the pen name Conrad Haynes, then had a very long, very dry spell during which I couldn't get anything published! That ended in 2010 with "Crashers," from the Minotaur line at St. Martin's Press. "Breaking Point" followed in 2011, and now here we are. Lesa - You've been writing novels for a while, but the character of Daria Gibron is new. Tell us about her. Dana - Daria Gibron has been with me since about 1999 or so. She originally appeared in "Crashers" and "Breaking Point" as one of several good guys in a vast ensemble novel. Her inception was easy. Both of those novels were about the people from the National Transportation Safety Board who investigate airline crashes. These are absolutely fascinating people, including engineers and pilots, pathologists and technicians. However, with such a vast brain trust in a so-called "thriller", I realized I was missing something: an action character. From there, it was a lot of fun ti imagine the tough, armed, battle-hardened character as a woman, rather than the traditional guy-role. And Daria was born. After "Crashers" and "Breaking Point," my editor, Keith Kahla, asked me if I thought one of the ensemble was ready to be the breakout character. And we both agreed it had to be Daria. She is so much fun to write! I tell people (truthfully) that if I just get out of the way, she often writes her own scenes. Lesa - Tell us about Ice Cold Kill, please, and where does the title come from? years ago, my sweetheart, Katy King, and I decided to celebrate New Year's Eve in Paris. It was unimaginably romantic. But it also was colder than heck. I was writing the first Daria book at the time. True story: Katy kissed me on the streets of Paris and I said, "Oh! Ice-cold kiss!" Later, while we were talking about the manuscript - Katy is a published mystery novelist, too - we began playing around with ideas for a title, and eventually settled on a slight variation of "ice-cold kiss." The story was a lot of fun to conceive because I've been a fan of thrillers forever. As with the creation of Daria - in which I gave a woman the classic male role - this plot let me set up a wide array of clichés, then to strike them down as if they were ten-pins. Daria also is grand fun to write because she has a skewed sense of her own purpose. She says she's an adrenalin-junkie and an adventurer, and she scoffs at the notion that she's the "hero." Even as she acts heroically throughout the stories. It's a lot of fun to write a character who mischaracterizes her own motivations - sort of like the brainy Scarecrow, compassionate Tin Man and brave Cowardly Lion. Lesa - Are you working on another book about Daria, or something else? Dana - The next book in the series, "Gun Metal Heart," is written and off to my editor. It's tentatively set for a winter release at the end of this year. Daria, again, is the protagonist. The secondary star - introduced in "Ice Cold Kill," is John Broom. I tell you: he's almost as much fun to write as Daria, and he makes a perfect foil for her. I'm having a blast with these characters! Lesa - You've worked in newspapers for years. What surprised you about the writing or publishing process for thrillers? Dana - The publishing process: The thing that surprised me is that my years working on small newspapers were the perfect boot camp for being a novelist. When yo work at a community newspaper, you're expected to be fast, accurate and think skinned. Nobody has ever heard of "writers block" - you go to a school board meeting, you write about the school board meeting. Period. I also can write anywhere. I do all my first drafts in longhand, in a Steno pad. I can write two or three pages while I'm in a waiting room before a meeting, or while sitting at a lunch counter. Noise can't bother me: In a newsroom, a cannon ball could sail over your desk and your biggest concern would be whether you spill your coffee. One of the most valuable things I've learned as a novelist is: it's not my job to write 400 excellent pages. It's my job to write five of them. Then five more, then five more....If you think of it like that, it's not a horrendously long slog with no end in sight. Here's a surprise: I've had great, great editors. I'm sorry to say, a lot of writers can't say that. Or at least they complain about it a lot. I had Kate Miciac at Bantam and Keith Kahla at Minotaur, and both made me a better writer. My dad says: It's good to be good but better to be lucky. I think I might be the living example of that, because I've been so lucky with editors. Lesa - What authors inspire you? Dana - Authors who inspire me: I went back recently and read Michael Crichton's "The Andromeda Strain." Wow, what a great book. I realized, after the fact, that it was a huge inspiration for "Crashers," because it focused on a group of academics struggling against a bad clock to solve a crisis. I read most everything by Robert Crais. I think John Le Carre is a genius. And the best all-time mystery, ever, had to be "The List of Adrian Messenger" by Philip MacDonald. Brilliant. Absolute master class in how to use the written words and images to fool a reader into thinking one thing, while the obvious is staring them in the face. I love Katy King's "City of Suspects," and not just because she's my sweetheart! Honest! Lesa - What didn't I ask that you'd like to cover? Dana - I have been amazed by the generosity of bookstore owners, librarians, store clerks and other novelists. This has to be one of the nicest communities in all of America. If you do well, people are genuinely happy for you! My first published novel was "Bishop's Gambit, Declined," which came out many years ago. I went to my first convention, where a terribly nice, older woman wanted to know all about my book. I was only too happy to tell her ("me" being my favorite subject). Finally, I asked her her name. "Marion Zimmer Bradley," she said with a shy smile. And pretty much everyone I've run into ever since has lived up to that level of civility. Lesa - Dana, your e-mail caught my attention when you said you're crazy about libraries and library patrons. I always end by asking authors to tell me a story about libraries. Dana - I had three books published in my twenties. The third, "Sacrifice Play," was a hardback published by Severn House in England. The local libraries all carried it, of course. But it wasn't until years later that it dawned on me that - thanks to the pound sterling's value against the dollar - my book cost twice as much as any other mystery. And for perpetually under-funded libraries in Oregon, that's saying something. Yet, of course, they all carried it, because I was a local guy. I'll never forget that about librarians. Lesa - Dana, thank you for taking time to drop me a note about the contest, and for doing the interview. 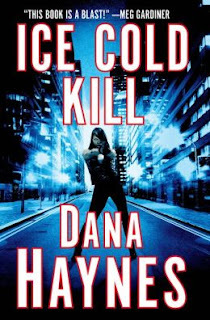 As I said, I'm giving away a copy of Ice Cold Kill this week. Here's the link - http://lesasbookcritiques.blogspot.com/2013/04/winners-and-tough-women-week.html Good luck! Ice Cold Kill by Dana Haynes. Minotaur. 2013. ISBN 9781250009630 (hardcover), 343p. Nice to see Dana back in print. I loved the Conrad Haynes books -- great characters! It sounds as if he has some great new characters in these books as well, Miranda. A thoroughly enjoyable interview! I especially loved Mr. Haynes stories about the title of the book, the 'nice, older woman' and the libraries/librarians carrying his book. Thank you! I enjoyed those stories, too, Karen. Nice to know Marian Zimmer Bradley was so nice, too!